When it comes to making music, Lindsey Luff lives by one main conviction: we all have stories to tell, and those stories are worth listening to. Rooted in the rich musical soil of Memphis, the soulful singer-songwriter found her way to Brooklyn to hone her alt-country and folk-inspired sound. There, amid the busyness and the noise, she spins heartfelt tales inspired by love, loss, and leaving. Lindsey sat down with All Things Go for her first artist interview before a show at DC9. Lindsey, thanks so much for taking the time to chat! We’ll start with the standard opening question: How did you get into music? I started singing in church when I was 4 years old. I always knew I wanted to do it, but I didn’t know what that looked like – how to do it, how to get into it. So when my husband and I graduated college we were like “let’s just move somewhere.” And we packed up and moved to New York, and just started figuring it out. So you were from Memphis, and then ended up in Brooklyn. What was that shift like? They’re vastly different. In New York there’s a hustle that doesn’t exist anywhere else. It’s always busy and moving. It’s the city that never sleeps. I know it’s very cliche to say that, but when I go home (to Memphis) I find myself with chunks of time with absolutely nothing to do, whereas in New York I always have something to do, whether it be a practice, rehearsal, writing session, or hanging out with friends – or just spending a quiet day at a coffee shop or something. There’s always something to do. There’s always something going on. Amid that busyness, have you found Brooklyn to be particularly inspiring or helpful in the creative process? Obviously there’s a robust artistic community there, but Memphis has a good music scene as well. Memphis has a very specific music culture, and they have a lot of music history. But as far as what’s happening in Brooklyn right now goes, I feel like there’s been this revival, especially of the kind of music that I do – that alt-country, singer-songwriter stuff – and it feels like you’re in community with people there that are always kind of doing what you’re doing. You may not be in the same genre, but it’s life-giving as artists support each other, and it’s very collaborative. It’s been really inspiring and motivating to be in Brooklyn and to be around those people. Tell us more about that alt-country/folk/singer-songwriter genre of music you do. What is it about that genre that drew you to make that style of music? I love good stories, and I love to tell stories. I feel like my life has been this one, continuous story, which some people know about and some people don’t. Even the people closest to me, like when I my EP came out, were like ‘Oh, is this about your dad?’ or ‘Is this about this?’ It gives me an outlet to tell stories – stories that I wouldn’t necessarily feel comfortable telling point-blank. It’s like I have my story to tell – but if I can write it or sing it in a way that other people can relate to then it makes it feel less like I’m alone in that story. So are the stories you’re telling on this EP primarily autobiographical? Yes. Very much so. I think sometimes we exaggerate just for effect, but for the most part they are very true to my life – my experience of love, loss, and leaving. Those three things have kind of been my overarching theme in my short time here on this earth. Not necessarily in a bad way, but in what I’ve learned from them. You mentioned growing up singing in church in the south. Does that faith background still inform the art you create and the stories you tell? It definitely shapes my music and my art, and it’s definitely part of my story, but I don’t want to lump myself in the “Christian singer-songwriter” genre. This question is always really tricky because when I moved to New York, a lot of people expected me to come and do Christian music because I grew up singing in church. But I feel like taking that label off of myself gives me a broader audience. That said, my faith is still very important to me, but I don’t feel like it’s the only thing I have to sing about. I want to make music for everyone. What is something you wish people would ask you about your music to understand or appreciate it better? That stuck with me, because he had this preconceived notion that because I’m in a relationship, because I’m married, because I have a significant other, that I don’t know what those things are like. And so it’s being willing to listen to the story that I think is really, really important. That’s my thing about people: we all have incredible stories, we just have to be willing to listen to one another. That’s kind of my thing. Can you unpack that experience of love and loss? You write this emotive music that tells these stories, what sort of place do they come from? I’m actually pretty optimistic, I just find that when it comes to dealing with my past and my story, one of the biggest instruments for my journey and dealing with some of the stuff I’ve dealt with has been writing. And so writing music keeps me sane. I try to be outgoing and have a more upbeat outlook on life, but I struggle with anxiety at times. My dad passed away this past February really unexpectedly, so that’s been really hard, and a lot of my songs are about my dad. It’s been really interesting to have all that come to a head. It’s just insane, because I didn’t know the man, but he’s influenced and impacted so much of my life. And so again, I write music to stay sane. It makes me feel like I’m learning more about myself and growing. I’m not just staying stuck in the pain or the heartache. Let’s shift to the music itself. I noticed you collaborated on one of the tracks of your EP. What was that like? And is there anyone that you’d like to collaborate with in the future? That’s a tough one. For my dream collaboration, I’ve really been digging Ryan Adams lately. It would be amazing to sit down and write just a heartbreaking, full story with him. I think that would be amazing. That’s like a far, far-off dream. Like way down the line, as far as goals go. Brian Elmquist, who I collaborated with on my EP and my upcoming full length, is great, and I really enjoyed working with him. I’ve also collaborated with my friend Ben Grace who helped me co-write a lot of my record. I’m still pretty new to collaborating and have only worked with a few people. So anytime I get to be in a room with someone new, it’s an experience I’m really grateful for. What other artists have influenced and inspired you? Ok, so I’m going to be really cliche, but The Beatles, because I grew up listening to them with my mom. I think they’re amazing songwriters and musicians, and I love their music. It’s very comforting to me. Now when it comes to people that helped me find what I wanted to do, and taught me how to tell stories, I’d say people like Emmylou Harris and Dolly Parton. Dolly’s songs are really fun and cheeky sometimes, but I think she’s a good storyteller. I’d also add Johnny Cash. As far as current artists go, Taylor Swift is a really good storyteller. I feel like if you can tell a story really well then people listen to you. So I’ve been influenced by this culture of music all my life. So I saw you had a kickstarter campaign, is there a full-length album in the works? There is a full-length album in the works. We’re finalizing and putting the finishing touches on it now and planning for a winter release. It’s such a strange thing to put out – like this piece of myself for people to listen to and experience in whatever way they choose. But I’m really really proud of this record. It’s my first full-length, which is really nerve-wracking and exciting and emotional and all of the above. But I’m excited for people to hear what I’ve been doing, because when I moved to Brooklyn a lot of people set a lot of expectations for me. They were like ‘Oh, you’re doing this, you’re not doing that?’ And so it’s one of those things where I can say ‘This is what I’m doing, and these are the stories I want to tell, and this is what I want you to know about me,’ but without having to actually say it. They can just listen to it. It’s also been such an incredible learning experience. I listen to these songs and I hear growth, and I hear this incredible struggle with some things that happened in my life during the process of making the record. I’m just really excited for people to hear it! 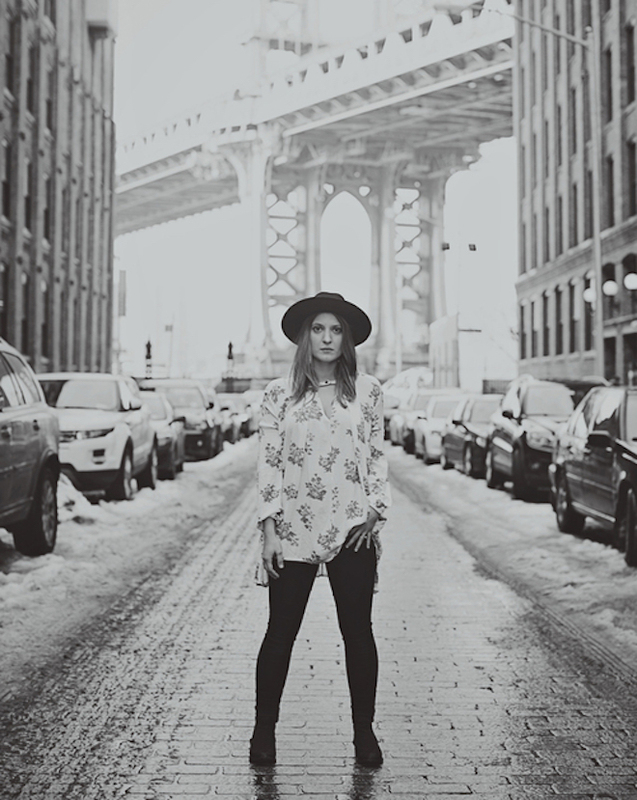 Stay tuned for Lindsey’s debut album, and be sure to catch her December 17th at Rockwood Stage 1 in New York.